On International Holocaust Remembrance Day, dozens of former prisoners, priests and staff of the Auschwitz Memorial laid wreaths at the former German Nazi concentration and extermination camp to commemorate the 74th anniversary of the camp's liberation, on January 27, 1945. They reunited at the so-called "wall of death" at Auschwitz Memorial's Block 11, against which Nazis executed thousands of prisoners. The main commemoration event was held at the camp's "central sauna", where new inmates were stripped naked, shaved bald and tattooed with a number on their arms by Nazis guards. Prayers and tributes were paid at the Monuments of the Victims. The Polish president Andrzej Duda and Prime Minister Mateusz Morawiecki attended the ceremonies. The Auschwitz Birkenau camp operated from 1940 until its liberation by the Red Army on January 27, 1945. Until the liberation, German Nazis murdered approximately 1.1 million people in Auschwitz, mostly Jews, but also Poles, the Roma, Soviet prisoners of war and people of other nationalities. For the world today, Auschwitz is a symbol of the Holocaust and atrocities of World War II. January 27 was adopted as the International Holocaust Victims Remembrance Day by the United Nations in 2005. According to the UN, the purpose of this is not only to remember the victims of the Holocaust but also to promote the education of the Holocaust throughout the world. On January 23, the European Parliament held a ceremony in Brussels to mark the upcoming International Holocaust Remembrance Day. European Parliament President Antonio Tajani, Prime Minister of Romania Viorica Dăncilă and Chair of the Jewish Agency Issac Herzog commemorated the victims of the Holocaust. "The Eurobarometer published yesterday that 50% of the Europeans see antisemitism as a problem in their country," said Tajani as he opened the ceremony. "This is unacceptable for us. We must act and react, we must reach out to citizens, in particular, the young people. They are the future of Europe. Our schools and universities should not only provide skills and knowledge. They should teach the importance of solidarity, freedom and respect for human dignity." In June 2017, the European Parliament adopted a resolution which urged member states to protect its Jewish citizens and institutions from hate crime and hate speech. But not every member state has adopted this resolution. The Chair of the Jewish Agency Issac Herzog called on EU states, who are yet to adopt the resolution urgently. "No words can ever do justice to the six million souls who were so cruelly murdered in the Holocaust", said British Prime minister Theresa May. The Spanish Prime Minister Pedro Sanchez promised that "we will not forget the barbarism of antisemitism, racism and intolerance." 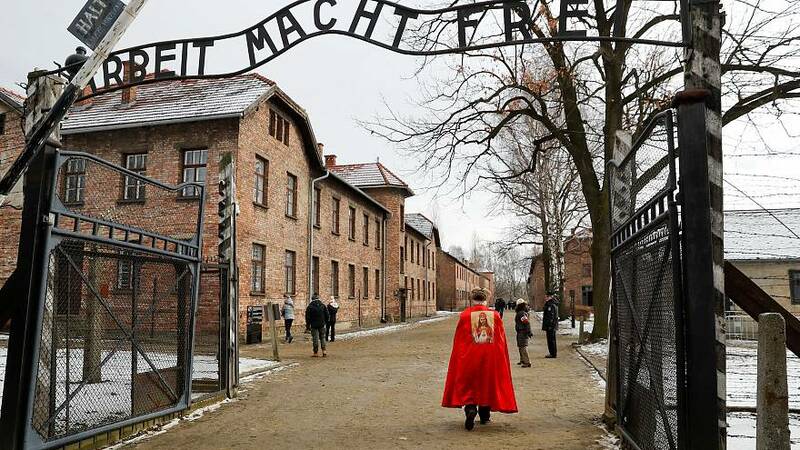 "Never again fascism, never again Auschwitz", said German Foreign minister Heiko Maas.